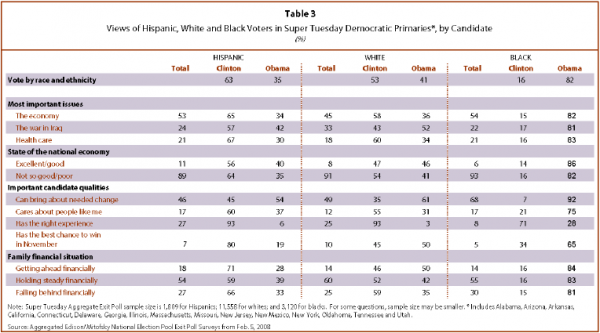 Nationwide, aggregated exit poll results from 16 Super Tuesday Democratic primaries show that 63% of Latinos voted for Clinton and 35% voted for Obama. Clinton’s biggest margin of victory among Latinos was in her home state of New YorkNationwide, York, where she drew 73% of the Hispanic vote. She won 68% of the vote in Puerto Rico, 67% of the Latino vote in California and 66% in Texas. She won 59% in Florida, a state where neither candidate actively campaigned because of an intra-party dispute over the timing of the primary. Obama narrowly won the Latino vote in his home state of Illinois on Super Tuesday—50% to Clinton’s 49%. Clinton’s support has come from virtually all demographic components of the Hispanic Democratic primary electorate. One finding that stands out from the aggregated Super Tuesday exit polls is that Latinos ages 17 to 29 were as likely as Latinos overall to vote for Clinton—63% versus 62%. In Texas, support for Clinton among young Latinos was lower than on Super Tuesday, though Clinton did win among young Latino voters there (51% versus 48% for Obama). And, as noted above, Latinos ages 17 to 29 comprised 21% of all Latinos voting in primaries on Super Tuesday. Hispanic women also favored Clinton on Super Tuesday—67% versus 32% for Obama, with women making up 56% of the Hispanic electorate that day. Clinton’s support among Latino women was similar across age groups. Young Latino men ages 17 to 29, however, split their vote evenly between Clinton and Obama. Race and gender played different roles among Hispanic voters on Super Tuesday. Those who said a candidate’s gender was an important quality in deciding their vote (34% of all Latino voters) were more likely to vote for Clinton than were Hispanics overall. By contrast, those who said that race was an important factor in deciding their vote (28% of all Latino voters) voted for Clinton by the same percentage as did Hispanics overall. 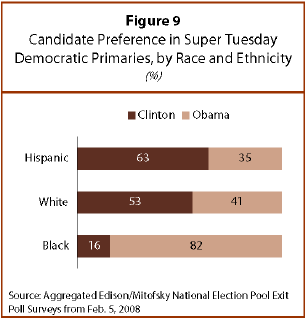 The candidate preferences of Hispanic voters in the Super Tuesday Democratic primaries (63% for Clinton, 35% for Obama) were different from the preferences that day of whites (53% for Clinton, 41% for Obama) and of blacks (16% for Clinton, 82% for Obama). This final section considers how the Hispanic vote differed from that of white and black voters across a range of attitudes and demographic characteristics. The economy has been foremost in the minds of many voters this primary election season, more so among Hispanic and black voters than among whites. Yet, the importance of the economy appears to have meant something different to Hispanic voters than to white voters. 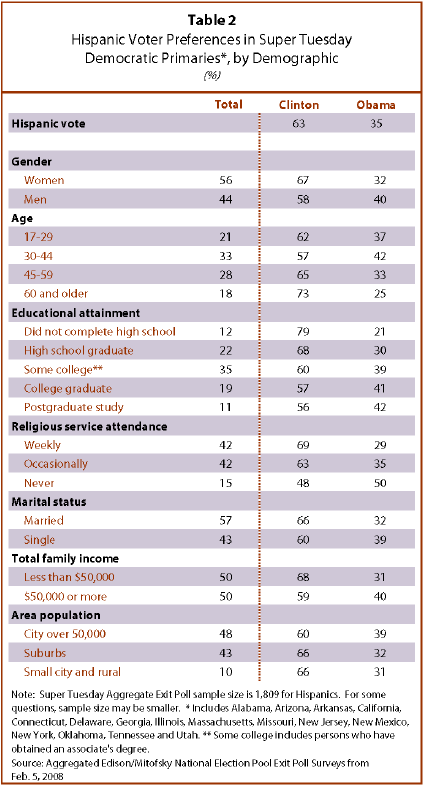 Among Hispanics who said that their family is getting ahead financially, Clinton was the preferred candidate. By contrast, white voters who said they were getting ahead financially favored Obama. The candidate quality that was most important to all three groups in deciding their vote was the ability to “bring about needed change.” But this mattered less to Latinos (46%) and whites (49%) than it did to blacks (68%). Also, Latino voters who favor change supported Obama by a smaller margin than did black and white “change” voters. Of those Latinos who said change was the candidate quality that mattered most, 54% voted for Obama and 45% voted for Clinton. Obama won the white “change” vote by a bigger margin—61% to Clinton’s 35%. Among black “change” voters, Obama won 92% of the votes to Clinton’s 7%. Among both Latino and white voters, women have formed the base of Clinton’s support in the early primaries and on Super Tuesday. However, the gap between her support from Latino women (67%) and men (58%) was not as large as the gap between her support from white women (60%) and men (46%). For Obama, young voters overall have been a key base of support, but, as noted above, this base was smaller among Latinos than other groups on Super Tuesday. Young Latinos, ages 17 to 29, were less likely to vote for Obama on Super Tuesday than were young white and black voters—37% of Latinos versus 57% of whites and 84% of blacks. Both Latino and white college graduates were more likely than Latinos and whites overall to vote for Obama. However, Obama split the college graduate vote among whites (49% to Clinton’s 47%), and Clinton won the vote among Latino college graduates (57% to Obama’s 41%). Race and gender are two issues that were in the forefront of some voters’ minds on Super Tuesday, with gender appearing to have affected voting more than race. Latinos (34%) were more likely than whites (19%) and blacks (23%) to say that gender was important in deciding their vote. For all three groups, those who said gender was important in deciding their vote were more likely to vote for Clinton than those who said that gender was not important. Race appears to have been less important than gender in influencing Latino voting, and race played a lesser role among Hispanics than among whites. Hispanics (28%) were more likely than whites (13%) to say that the race of a candidate is important in deciding their vote. However, Hispanic voters who said that race was important were equally likely as Hispanic voters who said that race was not important to have voted for Clinton—64% versus 63%. Among whites, those who said that race was important were more likely to have voted for Hillary Clinton (60%) than were those who said that race was not important (52%).